The record is made up of 1 item (56 folios). It was created in 1908-1911. It was written in English. The original is part of the British Library: India Office The department of the British Government to which the Government of India reported between 1858 and 1947. The successor to the Court of Directors. Records and Private Papers. the quarantine arrangements at Bahrein. be borne by Imperial Funds. The item consists of part two of the subject file 2908/1907 Persian Gulf Historically used by the British to refer to the sea area between the Arabian Peninsula and Iran. Often referred to as The Gulf or the Arabian Gulf. : Quarantine. It contains correspondence regarding proposals for improving and financing quarantine arrangements and plague prevention measures at Bahrain. The main correspondents are as follows: the Political Resident A senior ranking political representative (equivalent to a Consul General) from the diplomatic corps of the Government of India or one of its subordinate provincial governments, in charge of a Political Residency. in the Persian Gulf Historically used by the British to refer to the sea area between the Arabian Peninsula and Iran. Often referred to as The Gulf or the Arabian Gulf. (Major Percy Zachariah Cox), the Political Agent A mid-ranking political representative (equivalent to a Consul) from the diplomatic corps of the Government of India or one of its subordinate provincial governments, in charge of a Political Agency. 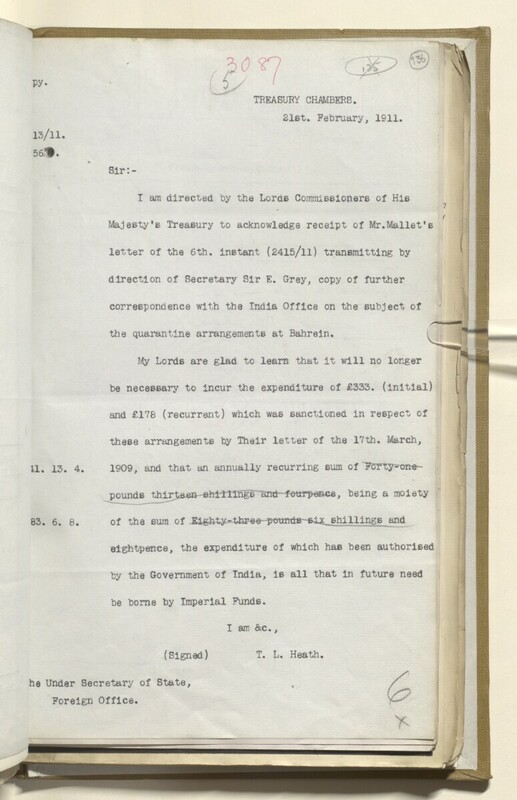 at Bahrain (Captain Francis Beville Prideaux, later Captain Charles Fraser Mackenzie), officials of the Foreign Office, and officials of the India Office The department of the British Government to which the Government of India reported between 1858 and 1947. The successor to the Court of Directors. . It also contains input from the Treasury, representatives of the Foreign Department of the Government of India, and Shaikh Esa Bin Ali Al Khalifa [Shaikh ‘Īsá bin ‘Alī Āl Khalīfah] – Ruler of Bahrain. The papers are arranged in chronological order from the rear (folio 181) to the front of the part (folio 126).